This is Millar’s third (and currently last) book. For me, since it was the second one he published. Also it is the least easy to get. Salamandar and Sons sell their books themselves and through a handfull of bookshops that do not list this title on their websites. Getting the book to Europe, makes it quite expensive too. The publisher is a nice one to have a further look at though, especially when you have an interest in alchemy. The book is hardly 170 pages (plus bibliography and index) and this includes two appendices with etchings (on unnumbered pages) of Hejonagogerus Nugir with explanations and some images referred to in the book. 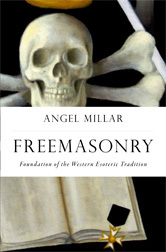 The chapters are about subjects such as Alchemy Cabala and Magic, Roman Catholic Mysticism, Rosicrucians (like the Gold- und Rosenkreuzer and SRIA), Golden Dawn, O.T.O., Wicca and a short chapter about Freemasonry and Northern European paganism (which was one of the reasons to write an article about this subject).